Now includes Knowledge Check Quizzes presented after each on-demand learning module to validate comprehension. Speeds up and improves the decision-making process so you can have greater awareness and stronger conviction for deciding where and when to enter and exit the market. Aspiring traders learn how to align to specific beliefs and behaviors causing information to be filtered, processed, and applied most effectively. They take away the understanding, knowledge, tools, and support to place and keep decision making ahead of price movement. 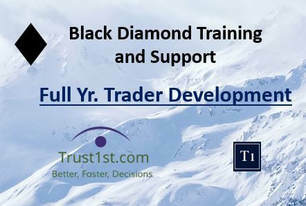 Aspiring traders with a clear development path and the comprehensive support to travel it. Struggling traders with the guidance and knowledge to see and fill the gaps keeping them from becoming a consistent earner. Established traders with the insight access and realize their potential. Performance improves as anxiety and frustration (stress) are replaced with certainty, confidence, and commitment. Students gain tangible understanding for how best to direct and support improvement and performance. Approximately 5 hours of instruction is broken out into 4 Sessions consisting of 9 Learning Modules presented through on-demand video recordings so you can tailor your own learning schedule. Approximately 60 to 90 minutes of reflective work is required after each Session so you can begin connecting more deeply to your work at functional, psychological, and practical levels right away. A live on-line monthly review including Q & A begins at 8:30 AM CT on the third Saturday of each month so you can keep going deeper into the Intuitive Development process. A 90-Day Reflection Cycle, 1 Reflection each weekday for 12 weeks (60 Reflections total) begins on the first Monday after completion of learning modules to provide highly targeted direction and guidance to support practical application of the Intuitive Development Process. ​The understanding, knowledge, and tools developed are universal in application. By aligning to specific beliefs and behaviors causing information to be filtered processed and applied most effectively you become significantly better at everything you do. As a trader your decision-making will get and stay ahead of price movement. You will learn how to build, maintain, and add horsepower to the Cognitive Engine optimizing decision-making and execution. Reflections (optional and purchased separately*) are formatted for printing. You are encouraged to print and collect the Reflections (there will be 60 total) so you can repeat the Reflection Cycle again and again. Repetition drives continuous improvement to ensure decision-making stays ahead of real-time events (price movement) and the ever accelerating rate of change. Advanced Training integrates the Intuitive Development Process taught in Basic Training with technical analysis, strategy formation, and trade execution. 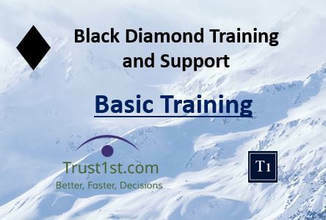 You learn how to construct the Intelligence Package needed to target the decision-making engine built in Basic Training. The E-Mini S&P; Oil; 10 Yr. Note; and Gold are the teaching examples. However tools and methods can be applied to any actively traded futures contract or stock. Ray Burchett, creator of Intuitive Development Training is the presenter of Advanced Training and all the elements comprising Comprehensive Support. Calculate proprietary value levels to frame the market so you can see the pattern price is likely to follow. Apply highly correlated momentum tools to forecast price movement so you can see when price is likely to be most active in following the pattern. Track volume independent of charting software so you are more connected to the energy driving price movement. Read the Trading DOM (Price Ladder) so you can fine tune your market entry and exit. Execute a Directional Trading Strategy to gain advantage over institutional, high frequency, fair value, and other retail traders. Plus recording of the January 12, 2019 Advanced Training Jam (approx. 3 hours) tying instruction to recent market activity. Evening Chartbook and Market Recap received on the eve of each trading day. 1) Construction of the Intelligence Package for ES, Gold, Oil, and 10 Yr. Note is reviewed. 2) Key technical factors triggering price movement in the Regular Trading Hours Session are highlighted. 3) Market structure and key technical factors expected to influence the Overnight Trading Session (Globex) are highlighted. 4) Focus and foundation for forecasting price movement in the next Regular Trading Hours Session are formed. Those who struggled to stay ahead of price movement are provided with the clarity to understand where they disconnected from market direction. This lowers anxiety by restoring focus. Those who performed well receive the reinforcement needed to speed up improvement. ​**Recordings of the Daily Briefing and Sunday Evening Review are posted within 90 minutes of completion and accessed through your Learner Dashboard. Combines Basic and Advanced Training and includes recording of the January 7, 2019 live on-line Training School Week (9 Sessions).